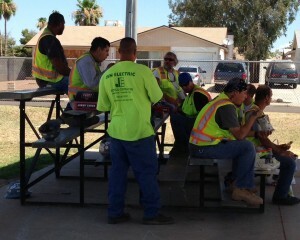 With the summer in full swing, Kim Anderson and I thought it would be fun to visit the guys out on the jobsites, bring them a nice cold lunch and lots of cold water of course. Last week we picked up Jimmy Johns and headed out to Desert Shadows Middle School. Thank you guys for letting us crash your lunch – hope you enjoyed! Jim Szoke is one of the Foremen on site and was lucky enough to win the Home Depot gift card in the raffle. But Jim being the nice guy that he is, held his own raffle and gave it to one of newer Jenco guys. Thanks Jim for the very nice gesture! This week we went out to Sunrise Elementary School and were even able to learn a bit about the work going on at the site. Thanks Dan Medina for coordinating with us to make this happen! We are working on the plans for next week.. Any lunch suggestions? !